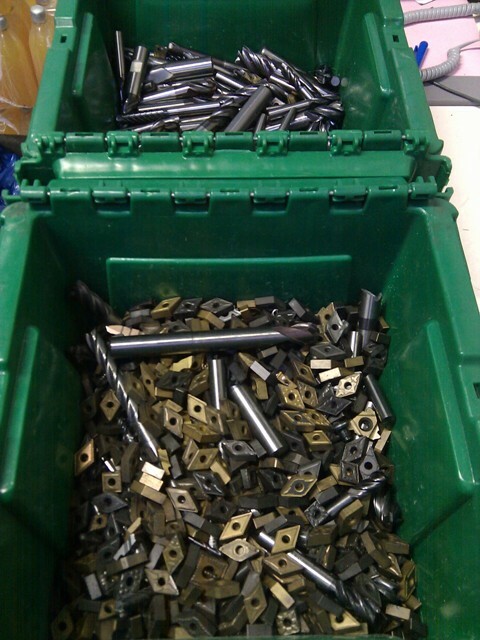 What do you do with your used carbide products? Helping you with your Enviromental Compliance and also helping you get a little back against the cost of your carbide tooling, NSERT UK offer a full scrap carbide recycling service. We’ll collect your scrap carbide (over 25kg) within 100 miles of our Sunderland offices and offer very competitive prices for all your waste carbide inserts, endmills, drills, reamers, threadmills and taps. Don’t be stuck with a low flat rate offered by other scrap carbide dealers! The price of raw tungsten is constantly fluctuating and we offer the latest current price for your carbide waste. UK national customers give us a call on 0191 5487099 and let us know how much carbide you have to weigh in and we’ll give you an idea of the price we’re currently offering, you can then ship the scrap to us to be weighed and checked before we confirm your price. Once weights and prices are confirmed we’ll send you your money. If you aren’t happy with the price offered we will pack up your scrap ready for collection no questions asked. This service is for CARBIDE products only – please remove all HSS products before weighing as we cannot offer prices on HSS products.